The deputy clerk of the National Assembly, Benedict Efeturi, confirmed to police investigators that the senate’s standing orders used for the 2015 elections of Bukola Saraki and Ike Ekweremadu as senate president and deputy respectively, were different from the 2011 version which should have been in use at the time, details of police investigation show. 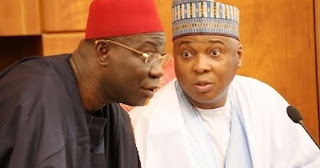 Mr. Efeturi made the disclosure to the Criminal Investigation and Intelligence Department of the Nigerian Police, which investigated allegations that the rules were forged to help Messrs. Saraki and Ekweremadu to their posts. He however said the alteration, which some senators denounced as illegal as lawmakers were not informed about, was based on the directive of the former senate leadership, led by its president, David Mark. He said the amendment was done “by convention and practice” and not “by procedure”, as previous versions of the rules were amended by the same method. Messrs. Saraki, Ekweremadu, Efeturi and a former clerk of the National Assembly, Salisu Maikasuwa, have been charged with forgery. They were arraigned on Monday before a High Court in Abuja. They deny wrongdoing. The senate president and his deputy accuse President Muhammadu Buhari of bias, and argue that the case is a violation of the independence of the legislature. In his statement to the police, Mr. Efeturi, who is also the Clerk of the Senate, said the leadership of the seventh Senate under Mr. Mark ordered the 2015 Standing Rules be amended “not necessarily by procedure” but “by convention and practice”. According to the report, he “stated that the leadership of the National Assembly of the 7th Senate ordered the 2015 Standing Rules as amended by their convention and practice. (He stated) that the Senate Standing Orders 2003, 2007 and 2011 followed the same procedure as that of 2015. He emphasized that in the Parliament, amendment of the Standing Orders is by practice not necessarily by procedure. Mr. Maikasuwa, who conducted the elections of Messrs Saraki and Ekweremadu, said he did not refer to any Senate Standing Rules, rather, he said he only performed his duty using “normal procedures for the opening of a new parliament”. He said, according to the police report, “that before the election, he called on the Deputy Clerk to the National Assembly who is also the Clerk to the Senate to read out the guidelines for the election”. He denied knowledge of the existence or production of an amended Senate Standing Rules 2015, saying he had no business in the daily activities in the Senate. He told the police Mr. Efeturi was “in better position to know of the 2015 Standing Orders as amended”. The report says a number of Senators, including Suleiman Hukunyi, Kabiru Marafa, Ahmed Lawan, Abdullahi Gumel, Gbenga Ashafa, Robert Boroffice and Abu Ibrahim, were invited during the investigation. In their separate statements, they said the seventh Senate did not amend the 2011 Standing Rules and thus, the amendment rules used for inauguration of the eighth assembly was fraudulent since there was no compliance with the requirements for amendment of Senate Rules. Mr. Lawan, who contested and lost the senate presidency to Mr. Saraki, said, “The procedures for election into the two presiding offices are clearly stipulated in Order 2 (2(i) of the Senate Standing Rules 2011. That contrary to the provision of the above order, the Clerk to the National Assembly introduced and used order 3(3) e (ii) of the purported 2015 Standing Order”. The report also noted the submissions of some former lawmakers like Ita Enang, who was chairman, Rules and Business in the seventh senate. Mr. Enang, now President Buhari’s assistant on senate matters, told the police that the previous Senate did not amend the rules. In the report, no complaint was raised against Mr. Saraki. He was not indicted. Although Mr. Ekweremadu was also not expressly indicted by the report, he was part of the seventh Senate leadership which Mr. Efeturi said gave orders for the rules to be amended. Mr. Ekweremadu was deputy senate president under Mr. Mark. The criminal charges came about a year after the report was submitted to the Federal Government. Mr. Saraki and the other three accused persons were arraigned before an Abuja High Court on Monday, triggering a war of words between Mr. Saraki and President Muhammadu Buhari.